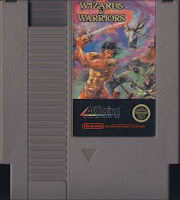 I've been playing some Wizards & Warriors lately, so I thought maybe I would share a bit of info about each game in the series. There's no real reason for this article to exist other than... well, I just want to talk about Wizards & Warriors! 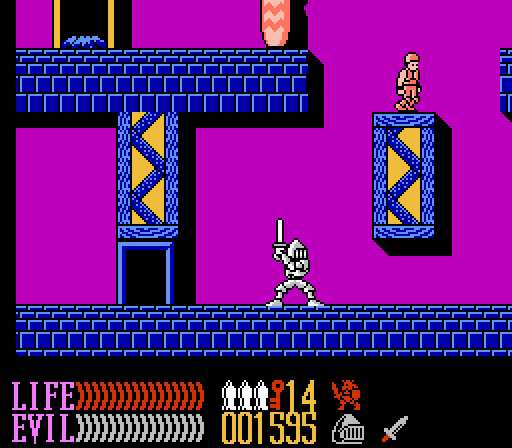 It's strange to think that Wizards & Warriors had four games released over the course of five years and then it just completely vanished. I don't know if the reception to the third game wasn't what Acclaim was expecting or if there was some other reason why it just ceased to be, but it's a series that is long overdue for a resurgence. 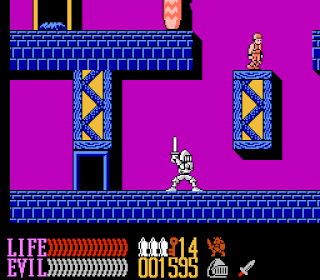 In the Wizards & Warriors series, you play as the mighty knight Kuros. The covers to each of the games might lead you to believe Kuros is a barbarian, but no, he's a knight. The wizard to Kuros' warrior is named Malkil, and he is found in each game of the series. The games are also developed by Rare. You know, the same people who brought you the Donkey Kong Country series, Banjo-Kazooie, and your precious Goldeneye. The original game is so different from other games in the series. The game basically boils down to collect X number of gems and find three different colored keys while doing so. A red knight guards the exit to most levels, and he'll demand payment in the form of gems before he'll let you through to the boss. 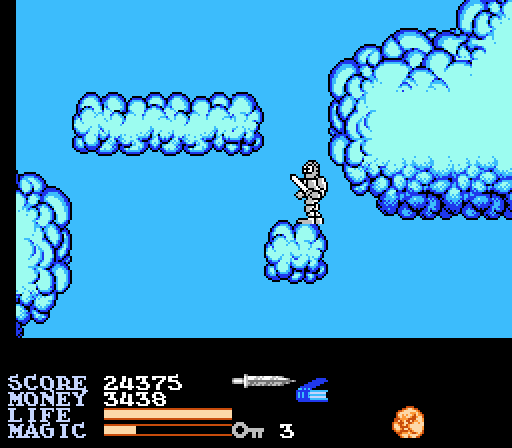 Defeating the boss will allow Kuros to save a distressed damsel who is hanging from the ceiling after each boss encounter. 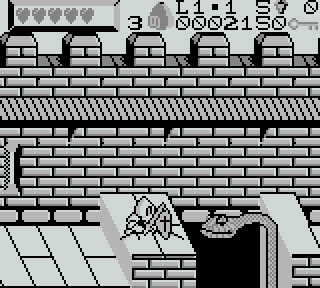 Most of the game takes place in palette swapped caves. While gathering keys in these caves, you can open like colored treasure chests to retrieve gems, items, or weapons. 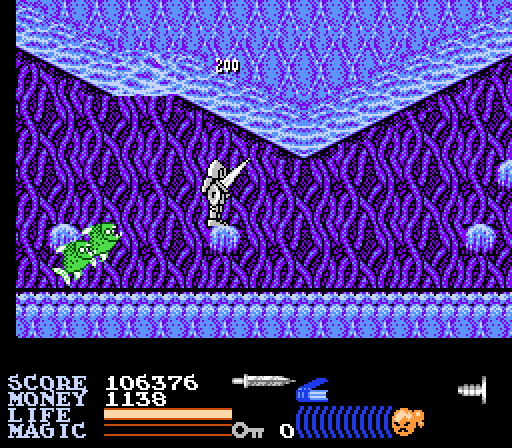 Some of the items are more of a hindrance than a help, such as the Cloak of Invisibility which renders Kuros invisible to the player but seemingly not to the enemies. However you can find a throwing dagger or ax which will let you attack enemies from a distance rather than jumping into them. Potions also periodically appear which will grant you invincibility or increase your mobility for a short while. 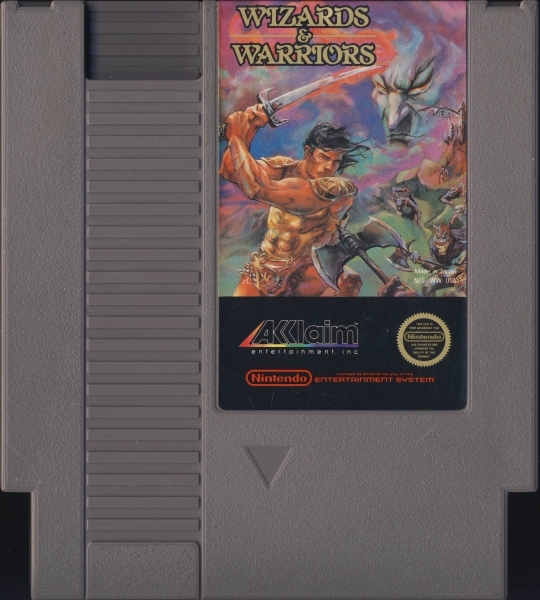 Wizards & Warriors gives the player infinite continues, and you pick up right where you left off when you use one. Therefore, the game can be finished with no problem providing you have the patience to get through it. 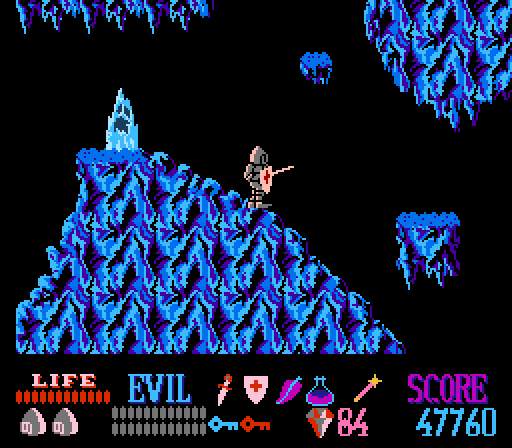 It's definitely not a bad game, but I personally feel that it is the weakest of the series on the NES. That might be a controversial opinion, but I stand by it. Easily my favorite game in the series and, in my opinion, the most polished. You can find a wide array of weapons, shields, and helmets in this game, and each one changes Kuros' physical appearance when collected. That's something I find extremely enjoyable in older games because it wasn't that common. I find it quite fun to just mix and match equipment pieces in unique combinations. 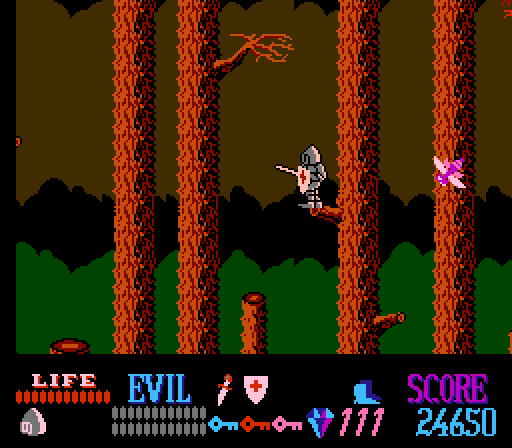 I believe IronSword was the first Wizards & Warriors game I ever played. In fact, along with Double Dragon II: The Revenge, it was the first game I ever bought with money I was given for my birthday. 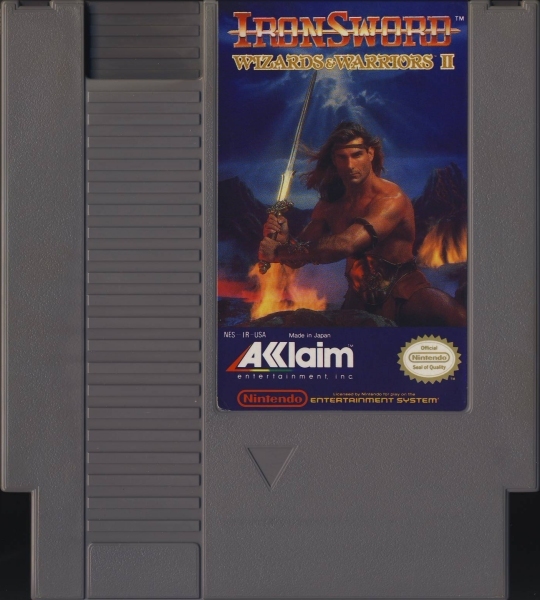 That might give me a bit of a biased opinion on the game, but I think you'd be hard pressed to find someone who doesn't think IronSword is the best. Anyway, in case you missed it, I wrote a spotlight feature about IronSword over the summer of 2015. Give that a look if you want to know more about the game. The legacy of IronSword seems to be the fact that Italian-American fashion model Fabio is on the cover. Usually this is the thing brought up most when people talk about the game. Don't act like Fabio doesn't look like ten million dollars on that cover, either. You know he does. If there were a black sheep entry in the series, this would be it. 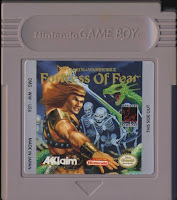 Fortress of Fear controls pretty sluggishly compared to the others, which is probably a given as you don't want a blazing fast character on the blurry little Game Boy screen. It returns to gem collecting like in the first game, though you don't need them to progress through the levels. In fact, I don't think they do much of anything except add to your score, and only your parents care about high score in games. 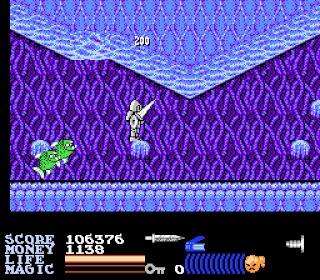 Kuros controls a bit differently in this adventure as well. No longer do you jump into enemies and try to poke them with the end of your sword to damage them. 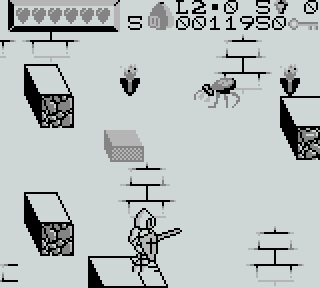 In this game, you can actually thrust your sword outward or swing it overhead in an arcing motion. 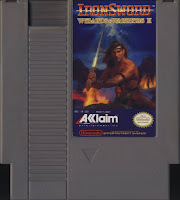 Oddly enough, of the four Wizards & Warriors games, I feel this one has the most intuitive attack mechanics. Also, I would place this game at the top of the list when it comes to difficulty. Sure Wizards & Warriors III has to be conquered in one sitting with no passwords or saving, but Fortress of Fear really brings the challenge. Enemies come out of nowhere and drain your life exceptionally fast. Wizards & Warriors III takes a drastic departure from other games in the series by giving the player a Metroid-esque experience. 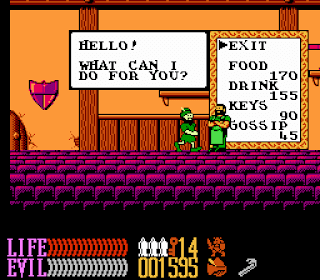 Unfortunately this game does away with the password feature found in IronSword, so you have to begin your adventure from scratch (ugh) every time you boot it up. This is problematic as the game is fairly lengthy and the areas can be quite confusing. An interesting thing the game brings to the table is the inclusion of guilds. You can visit three different guilds: The Thieves' Guild, the Knight's Guild, and the Wizard's Guild. Each one will challenge you with a trial before granting you the abilities from that guild. 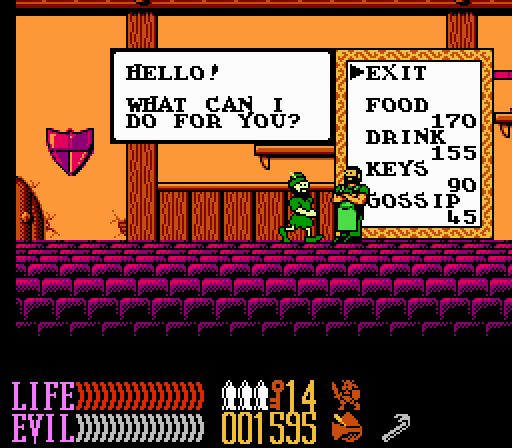 For example, finishing the third Thieves' Guild will grant you the ability to break into windows and explore houses, among other things. It's a cool little addition to the series. It's a little strange that this was added to the fourth game. Now Kuros is walking around as the wizard? What kind of crazy world is this? 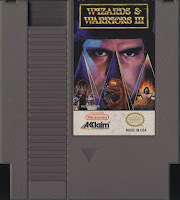 Wizards & Warriors III is definitely the beefiest adventure in the series. It's also more than likely the one people have played the least. So there you have it. Wizards & Warriors has been around for quite a while, and nothing has been done with it for over 25 years. It's definitely a series I would like to see come back. It's unbelievable that there wasn't at least one on the Super Nintendo. Maybe some day we'll have a new entry in the series. Like E3 2018: Wizards & Warriors IV! Someone make it happen!